In 1907 the journal, The Iron Trade Review, reported, "The Empire City Iron Works, New York, has filed articles of incorporation with a capital of $10,000 to construct buildings, iron work, etc. The incorporators are B. T. Greenfield, 35 West 115th street; Charles Schindler, 100 Third avenue, Max Rodgur, 54 East 105th street, New York." The following year, 1908, The Trow Copartnership and Corporation Directory of the Boroughs of Manhattan and the Bronx, City of New York listed "Empire City Iron Works (N. Y.) (Charles Schindler, Pres. ; Robert Podgur, Sec. Capital, $10,000. Directors: Bertha T. Greenfield, Charles Schindler, Robert Podgur) 838, 10th av." In 1909 the Trow entry read, "Empire City Iron Works (N. Y.) (William J. Greenfield, Pres. ; Leopold Heffner, Sec. ; Samuel Grill, Treas. Capital, $10,000. Directors: William J. Greenfield, Leopold Heffner, Samuel Grill), 838 10th av." The last two named officers, Leopold Heffner and Samuel Grill, although not the company's founders, assumed control of the company by 1910/11. They had been partners at Heffner & Grill, Iron Works, located at 749 9th Ave., since 1907/08. Leopold Heffner (1879-1962) was born in Vienna 4 Oct. 1879 and immigrated to the U. S. in 1903. His naturalization petition dated 15 April 1912 states that he emigrated from Glasgow, Scotland, 30 July 1903 aboard the vessel Astoria and arrived at the port of New York 8 Aug. 1903. The Astoria's manifest recorded his name as Leisca Häffner. He was 25 years old, his occupation was locksmith, and his place of birth Wien, Austria. Leopold Heffner is recorded in the 3 successive U. S. census reports from 1910 to 1930. In 1910 he lived on Dawson St. in the Bronx with his wife, Bertha, and four small children. In 1920 he lived at 1764 44th St., Brooklyn, when the children were teenagers. In 1930 the family home was 814 E. 3rd St., Brooklyn, when only the youngest two children remained. His son, Simon, age 23, was listed as an assistant secretary in the family business. Heffner registered for the draft in 1918 (World War I) and in 1942 (World War II). In 1918 he was 34 years old and the owner of the Empire City Iron Works located at 896 8th Ave. (near 54th St.). In 1942 he was 64 years old and employed at Empire City Iron Works, now located on 46th Ave., Long Island City, Queens, N. Y. Among the death notices in The New York Times, 21 Feb. and 22 Feb. 1962, was one placed by the office employees of Empire City Iron Works, who expressed "their sincere sense of loss upon the death of Leopold Heffner, its founder and president." Samuel Grill (1880/81-d.1918-1920) was Leopold Heffner's partner in the early days of their lives in New York City. Like Heffner, Samuel Grill filed a petition for naturalization 15 April 1912. He stated there that he was born in Galicia, Austria, 15 June 1881 and that he emigrated from Glasgow, Scotland, on the vessel Anchoria, 30 June 1904, arriving at the port of New York 8 July 1904. (Grill's name on the Anchoria's manifest is Schulen Grill. His age was 24, his occupation was recorded as locksmith, and his place of birth was Kolomea, Austria.) His World War I (1918) registration gave a different birth date: 15 Aug. 1880. Grill must have died shortly after this registration (12 Sept. 1918). He appeared in the 1910 U. S. Census (age 29, born Austria, immigrated 1906, iron worker), living at 712 9th Ave., Manhattan. But in 1920 it was his widow, Fanny Grill, who now lived at 331 E. 124th St., Manhattan. Her daughters, Pauline, age 11, Bertha, 8, and Lily, 4, lived with her. 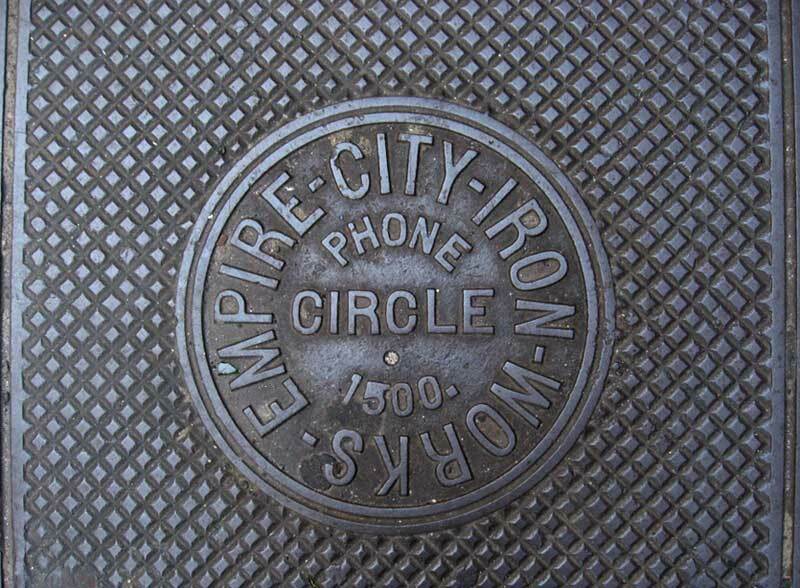 Empire City Iron Works were founded 1907/08 when they were located at 838 10th Ave., Manhattan. In 1912 they moved to 898 8th Ave., where they stayed until 1919. Their telephone number at this location was Circle 1500 from 1915 until 1919. In 1920 the foundry in Manhattan closed and reopened in Long Island City, Queens, As reported in Engineering World, 1 Jan. 1920, "Empire City Iron Works, 898 Eighth avenue, has acquired property on Tenth street, near Vernon avenue, Long Island City, comprising about 10,000 sq. ft. for the establishment of a new works." The property between Vernon Blvd. and 11th St. on 46th Road (10-37 46th Rd.) and 46th Ave. (10-36 46th Ave.) has been their home since 1926/1927. A 1926 building on this site was reconstructed in 1959. In June 2009 Empire City Iron Works appeared as shown at 10-37 46th Road, Long Island City. The rear of the property also featured an Empire City sign on 46th Ave. In Oct. 2010, Empire City Iron Works' business was described at Goliath: Business Knowledge on Demand as "Construction; Ornamental metal work contractor; manufactures stairs, fire escapes, balconies, railings and ladders; manufactures prefabricated metal stairs, staircases & stair treads; fabricates architectural metalwork, steel fabricator." Other Empire City coal chute covers can be found on East 67th St. and East 71st St.. The opening on West 78th St. seems to be a sidewalk drain. The last two of these have the address 838 10th Ave., where the company was located from 1907/08 to 1912.